Well Saturday night was the lunar eclipse, I wonder how many other eclipse photos make it onto the DPB?? You big fat LIAR! You stole these from the National Geography magazine from April of 1960!!!! LOL! Wish we had it here...no moons out tonite I'm afraid! Well, that's because it's still DAY! Well this one obviously HAS been 'shopped', but only to stitch it together. Wouldn't NG at least have focussed properly! Focused and at LEAST showed ALL the PLANETS!!! GEEEEEEEEEEEEEZ!!! You only showed SIX of THEM! I think I'm seeing stars now! I think I squeezed a star or two in there! Ooops, wait a minute....naaah, sorry, it was only a spot on the monitor! THREE! Nice photo stitch! We weren't treated to this eclipse tonight and I was hoping someone would post the photo. You put together an amazingly beautiful composition! Oh, this is lovely! I'm looking out my window here on the west coast of WA, USA, at a big, fat, gorgeous full moon (between the clouds). Fun to see what you saw about 8 hours before my full moon here. I was going to ask how you did this image, but you mention the stitching together. Really, really nice! PS, thanks for your kind comments about my window reflection shot! -K.
I missed seeing it in person, so I'm so very glad that you shared your awesome photos. Great idea to stitch it all together - makes for a great effect. So far Tel Aviv, Venice and Rome DPs have some pics. Mine are still in the camera, but I'm not hopeful they'll be any good. It was rather cloudy here. Saw the moon as the eclipse was starting, didn't really see it at full eclipse, but saw it looking like a crescent moon about half past midnight -- went to bed then! Kim, I shouldn't have used the 'stitch' word as that has nothing at all to do with the technique I used! I took the six images and saved them as 6 layers in Photoshop, then just cut out the background in 5 of them so the last one showed through. Then I jiggled them around so they lined up! JB, I don't have any sophisticated equipment, it was taken on my Nikon D40 with a 55-200 lens, quite long exposures to capture the light so it was mounted on my cute little Manfrotto Modo tripod. Some great shots of the eclipse. 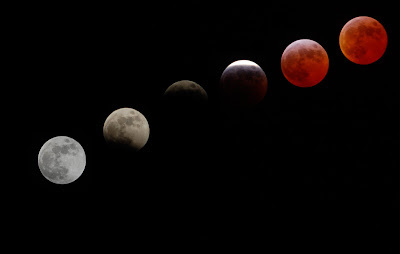 My photos can be seen at http://ackworthborn.blogspot.com/2007/03/lunar-eclipse.html which includes links to photos on a number of DP blogs including this one. I'm so jealous: too much clouds in Brittany to see anything...so I do enjoy your photo! It is a good photo(s) in spite of how you got it. I don't know about the red moon though. I have seen a lot of those today and never saw one that I recall that bright of red. Thanks for stopping at my blog and for commenting on the black flag. The red colour was not visible to the naked eye, it only became apparent after a long exposure. I certainly have not boosted any saturation, nor anything else for that matter. You were lucky to see the eclipse. It was too cloudy here yesterday to see it properly. Yes I think your pictures qualify. I hate when people post pictures on their blogs that have nothing to do with their cities or towns or even countries. I really like your Moon! ONLY CLOUDS AND RAIN, pitty me. The Crocus? They are real, I did boost the saturation a little, but the original is not that different.